Advanced Football Analytics (formerly Advanced NFL Stats): Do Comeback Wins Equal Future Regression? Last week, Brian wrote a post examining teams that have blown multiple games within a season in which their win probability was 95 percent or higher. The "blown game factor" statistic he referenced is essentially a reversal of the comeback factor (CF), a measure of how unlikely a given win was. You can click on the link for a fuller explanation, but for the purposes of this article, just know this: a CF of 20 indicates a team's lowest win probability during the game was five percent. So using this "five-percent rule," we can do the opposite exercise, and take a look at the teams with multiple "big comeback" wins within a season, including the playoffs. Examining the blown-game article, it was interesting that most of the teams were mediocre, with a few especially bad teams and a few very good ones. But excluding the 2013 Bucs and Texans, the average number of losses was 8.5, the definition of average. Team >20 CF Playoffs? Win Diff. Next Year Playoffs Next Year? The teams with stars next to them were quarterbacked by either Tom Brady or Peyton Manning during at least one of the seasons—either during the multi-comeback year or the following year. All six teams made the playoffs the season following their multiple comeback years, defying the laws of regression. This makes total sense; a team with a super-elite quarterback naturally has a better chance of erasing a big deficit. In fact, the Brady- or Manning-influenced teams actually averaged an improvement of roughly 2.3 games the next year. But eliminating those Brady and Manning teams, we have eight teams who made the playoffs on the strength of a couple big comebacks. Of the eight, six missed the postseason the following year, and their average win differential was minus-3.75. The Saints went from champs in 2009 to first-round losers the next year, while Baltimore went from a first-round bye in 2011 to...oh wait, things turned out OK for the 2012 Ravens. The Ravens are really the only true outlier though, as the general trend was that playoff teams with multiple comebacks could not sustain their success the following year. Just scouring this list, we can see some of 21st century's flukiest teams, like the '01 Jim Miller Bears that somehow went 13-3, or the '09 Bengals, who had a 10-6 season sandwiched between two four-win seasons. So what does this mean for the present and future? Last year, an astounding five teams had multiple wins with comeback factors of 20 or greater: the Seahawks (the only team with 3), Texans, Colts, Ravens and Titans. One of the Seattle wins was technically the infamous "Fail Mary" game against the Packers, but even if you exclude that, the Seahawks still fit the criterea. Well, thus far, the model isn't really holding up. There are two teams who have regressed as expected (Ravens and Texans), one team that is still roughly mediocre (Titans), and two teams that have actually improved (Seahawks and Colts). Once again, it appears quarterback play is at the center of the trend. 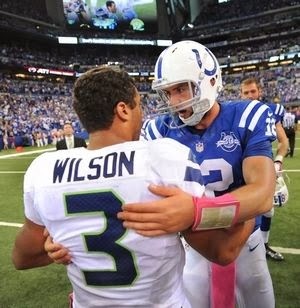 Seattle and Indianapolis are both blessed with supreme young talents in Russell Wilson and Andrew Luck, and in particular with Luck, natural improvement has offset the expected regression. Ironically, Seattle is one of three teams who has had multiple big comebacks this season, along with New England and Houston. It's slightly imperfect, since I am counting playoff games as part of the comeback factor, and these are only regular-season stats. But the general idea doesn't really change based on how you want to filter the games—improved quarterback play is almost universal in teams that defy regression. In fact, the chart portrays a couple of the biggest quarterback upgrades in recent history, like the Broncos trading in Tim Tebow for Manning, or the Rams getting a Pro Bowl season out of Marc Bulger a year after the catastrophic end of the Kurt Warner era. Based on this information, we can revisit the Seahawks, Patriots and Texans, the three teams who already fit the 2013 criteria. Seattle and New England will be just fine so long as Wilson and Brady stay healthy, but Houston might be even worse than their 2-6 record suggests. In fairness, they did blow two sure-thing wins against the Seahawks and Colts, but unless Case Keenum develops rapidly, Texans fans are probably in for a long season next year as well. 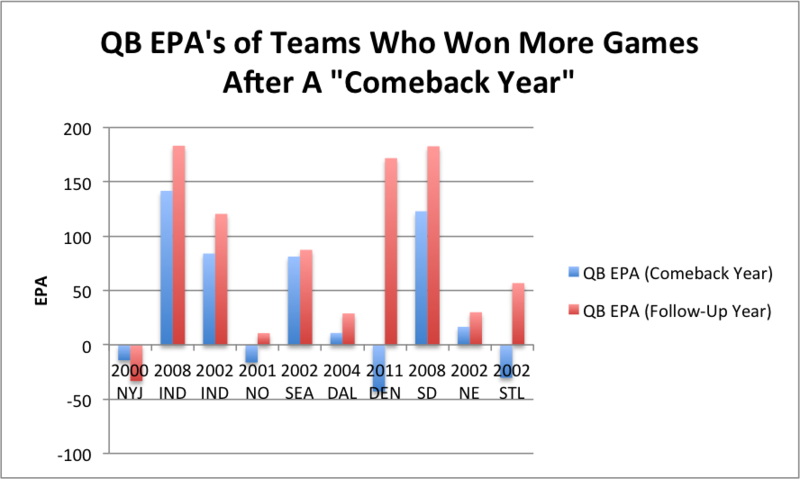 Ultimately, comeback wins are not a perfect indicator of future regression, as quarterback play basically trumps everything in today's NFL. But multiple comebacks that lead to playoff berths can hide poor quarterback play, something that should be considered when evaluating a team's future prospects. Somehow, Vinny Testaverde led more comeback teams to win improvements than Brady, but clearly that has little bearing on who the better quarterback is. So the next time you hear a talking head ramble about a mediocre quarterback's "intangibles" and "clutch factor" as a legitimate skill, just shake your head and move on. I would think you'd want to measure this against a control group, consisting of teams that won close games without needing comebacks. Vinny Testaverde was actually pretty decent by some measures (http://www.pro-football-reference.com/blog/?p=5449). I think rather than discounting your hypothesis because Testaverde also had a lot of comebacks, you've actually found another stat that attests to his ability. Fact: Vinny Testaverde's helmet looks like a football.